This is me hitting a couple of forehands against the wall. I'd really appreciate it if you could comment on my technique. I personally think that I don't get into a proper laid-back position when I start swinging forward, I unconsciously move my wrist forward for some unknown reason and that, to my money, makes my forehand inconsistent. How can I sort them out? It could be that your wrist is not as relaxed as it should be. b) Shadow swings with no racquet? You'd be amazed how many people can't do the later. Does look pretty good. I think the elbow is fine, that's pretty common. Looks like you are kind of reaching or lunging at the ball. Maybe your are holding the lag too long. In the video below you can see Fed lags but then as he's hitting and right after the lag starts to dissipate, and the wrist is returning to a more neutral position. There's not a wrist snap, but at the same time there is some release of the lag. That might be what you are sensing is missing. Generally, looks good. Nice forehand. I think your arms could be a little more fluid and relaxed and I think extending your contact point slightly further in front of you would be of benefit. other stuff... seems like you're reaching for you contact a bit (seem to lunge a bit), and how far back your hand goes on the backswing could be shortened (helps reduce total amount of time needed to prep for fast or on the rise shots). watch macci's vids... "pat the dog" position, to me is too far behind you.... not terrible, but you losse the whipping (now it's more like a drag) if the hand is closer to you. Thanks for your tips guys. Very much appreciated. Yes, I can do it in shadow swings, but when I really play, it seems I unconsciously move my wrist forward in order for the racquet to make a nice contact with the ball. It seems I'm scared of being late and that's why I start to correct the string bed angle unconsciously. I really want to maximize the lag. Is it possible for an amateur to lag as much as pros? I would work on your balance and spacing. 1st forehand ur lunging and leaning forward out of balance. 2nd ur leaning sideways and also your spacing between you and the ball is off. Yeah it's possible for some but not all pros have huge lag in the wrist. Yes, I can do it in shadow swings, but when I really play, it seems I unconsciously move my wrist forward in order for the racquet to make a nice contact with the ball. It seems I'm scared of being late and that's why I start to correct the string bed angle unconsciously. I'll give a contradictory view. Position your swing at what you think is the ideal contact point - right where you will hit the ball. The wrist should be extended (laid back). Remember what that feels like. Now when you swing and start your forward motion with your arm, let you wrist lay back into the contact position. AND THEN WORK ON SWING THROUGH CONTACT WITH NO WRIST MOVEMENT. I know everyone thinks pros are lag and snapping and releasing the wrist but I think that is the most misunderstood part of what TTers call a modern forehand. You don't have to "lock" the wrist and get a death grip on the handle to keep the wrist laid back instead just think maintain the same wrist angle through contact. Your forehand consistency and directional control will go way up if you do this. This has been discussed many times already and its just plain wrong period, video footage shows otherwise, proven many times. Here are photos before, at contact and after contact. Notice very little change in the wrist angle. Especially notice that the wrist is very laid back after contact. The 3rd photo is well after contact and still very laid back. If there is any change in angle it is very very subtle. My opinion is the change in wrist angle in the modern forehand is very misunderstood. The windshield wiper action and wrist release occurs after the ball is gone. I also think working on a stable wrist angle before, at and just after contact is a fantastic way to practice. I think there are many rec players with sloppy forehands because they are trying to muck with the wrist to get power and directional control and I think that ain't good. John Yandell's site and his post here have also indicated that pros actually restrict wrist movement around contact. This is to gain control and consistency. So basically what your saying is you completely ignored my pictures or you are blind. The interesting thing is, what John Yandell says may be true about actively trying to restrict the wrist, but that proves even more that the wrist is released through contact. Otherwise there would be no reason to restrict its movement. That's how you get the most RHS, by releasing the wrist prior to contact such that it goes from extreme laid back to less laid back which is a net wrist flexion. It doesn't mean you flex past neutral (i.e. hence the Yandell restriction), but the net difference is indeed a passive wrist snap = slight wrist flexion. Many videos of Federer show this. Having said that, it may be too difficult fo rec players to control that at first and they might be better off holding the wrist back until the correct contact point is established consistently and only then work on releasing it. Wrist is used to control direction in many different situations, sometimes it requires for you to completely let it go passively and release (cross court), sometimes it requires you to inhibit it much more and release later (inside out), your not even doing it actively, your doing it automatically, you just do it in order to aim at spots and you learn to do it subconsciously from playing and hitting thousands of balls. From your video it appears your racket is dropping very well on your FH !!! Guys, I'm not very concerned about whether I'm snapping my wrist at contact or not. The thing is I don't get enough lag before contact. When I start swinging forward not only my wrist doesn't lag as much as I want but also it starts to release early. That's what I can't find a cure for. If you look at the pros, they keep their wrist laid back until the very last moment. What they do at contact (whether reasling the wrist or keeping it laid back) is not my question. It is certainly possible to lag as much as Roger (and many other pros) but that amount of lag is not absolutely necessary. James Blake had one of the best FHs in recent times and employed considerably less lag than Roger. If you really want more lag, it is a matter of relaxing your grip and passively "letting" the wrist bend (wrist extension) rather than actively "forcing" it to bend. Roger accomplishes this by uncoiling his torso/body and pulling the racket handle forward while allowing the racket head to lag behind. In order to prevent yourself from being late, be sure that you are executing your unit turn (coil) early. Notice that Roger does this well before the ball has bounced (more or less as the ball is crossing the net). He also starts his uncoil fairly early -- as his racket has dropped (just prior to commencing his forward swing). If you perform these actions early, you should be able to develop greater lag w/o being late. I also recall a college team coach who played internationally at a 6.0/6.5 level. He employed a very neutral wrist -- even less lag than you are showing in your post #21 image. I agree with your analysis. You're not getting good layback right before contact. The layback, and then allowing the layback to release into the contact point, is where the free, easy power comes from. Other than that though, your swing looks pretty nice. One thing that might help is thinking about keep the racquet head near your right hip during the first part of the forward swing. That will allow you to build up the layback. Well, that's one way of looking at it but I don't see it way. Restricting wrist movement doesn't prove the wrist is released. In my view it proves advanced players aren't thinking about releasing to flexion around contact as they are thinking about maintaining directional control of the racket head angle instead. RHS is primarily a function of use the core rotation to swing a relaxed arm. Any "extra" RHS derived from intentional wrist movement isn't worth the extra risk introduced as mistiming the hit is far more likely. What is a "passive snap"? I cannot think of 2 words more contradictory that passive and snap. Snap implies a sudden quick motion and passive implies going with the flow in a smooth manner. I agree they're not thinking about it. Some wrist flexion naturally occurs as a byproduct of relaxed arm and wrist. As I mentioned above snap = wrist flexion. The wrist flexion happens passively as a result of a relaxed arm and wrist, hence passive wrist snap as opposed to intentional. Implying I said anything about intentional wrist snap is a straw man. what i found out is that these online lessons mostly make us do too much and stupid.just try to find the most natural swing you can and do not focus on the wrist as this is a automatic thing if you do it right,rather focus on brushing the ball under - feeling it.really - if you raise and extend your off hand and move with your torso,prepare in time - and have a relaxed loose grip - you are already half way.. Finally I started to get some lag on my forehead, but I still have some tremendous trouble with my elbow. 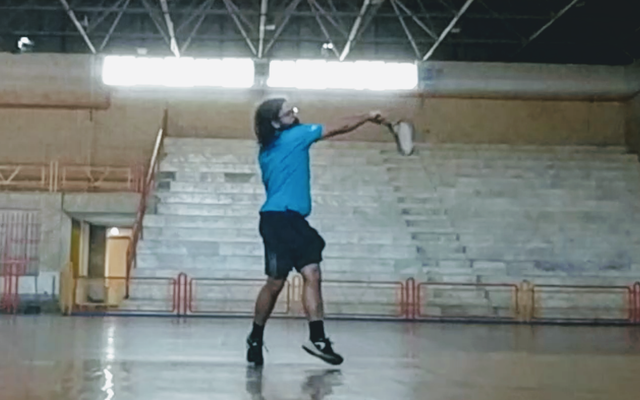 As you can see in the video below my forehand swing looks releatively good on low balls and I can generate some good pace when the ball is at my waist height or lower. But the problem with high balls keeps bothering me. As it's noticeable in my last forehand, my right elbow remains stiff and straight long after contact and that makes my forehand so inconsistent and also ugly on high balls. Even when I try to hit with a double bend technique, most of the time I'm not able to swing in the same way as when hitting a low ball. The thing is even straight-arm guys such Nadal and Federer bend their elbow soon after contact but mine remains so straight for a long time after contact. And the problem, to my understanding, has to do with the balance between Internal Shoulder Rotation and forearm pronation. As seen in the picture below, it seems I don't do a lot of ISR and instead I over-pronate my forearm which is obvious from my racquet face. And the disappointing part is I can't fix it. That made me think maybe I'm visualizing my forehand wrong. What would you think I'm doing wrong? Just a thought: you need a bit of a weight in the hoop for a good flip of racket( don’t like ‘lag’ as it means nothing, even all WTA players have that). Roger's racquet is something like 10 points head light. Not a lot in the hoop. Was referring to swing weight obviously. And what can I do with my stiff elbow? Should I actively try to bend it after contact? Well a whip does not have a muscle in it, but it still snaps. To "snap" a whip, the hand holding the whip grip has to have a sudden forceful change in direction. Are you advocating a sudden forceful change in direction in a FH swing path? Ah yes, the core rotation from the legs up, transmitted through shoulders, arms, wrist. The socalled kinetic chain. A lot of what is seen as laybackof the wrist is actually external rotation of the arm. Also using a semi or full westerngrip will already create some natural angle between the forearm and racket even with a neutral wrist. 1. Hold the racket in a western grip to the side in the "pat the dog position". 2. From there externally rotate the upper arm and forearm as much as you can while keeping the wrist stiff. You can get a lot of lag like this. Made this gif (click on image) just externally rotating the arm and supinating the wrist while keeping it stiff. Now pro players use some wrist extension too but most is probably turning of the wrist and not bending it. Here’s what I suggest take 50 balls and go to the doubles alley. 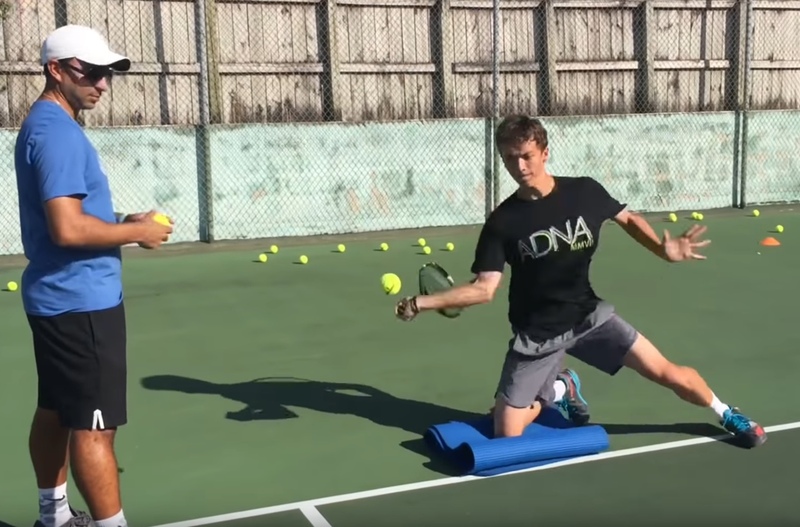 Now aim to hit forehands into the alley on the other side of the net using only trunk rotation arm, wrist, rackquet is completely passive only trunk rotation Once you see for yourself the mechanics of trunk rotation you will have the necessary belief to master wrist lag. How can I externaly rotate my arm? Can you still hit the same shot? You change the racket face angle between the two "methods". The ball's gonna be sent in different directions.